Ascot trio Febueder couldn't better defy expectations. All aged 18, the boys may fill their time with skateboarding and music, but there’s none of the slacker rock so synonymous with that lifestyle present in their writing. No, there’s something far more precocious about Febueder’s sound, like the trio – Kieran Godfrey (vocals/guitar), Harry Summersgill (bass), Samuel Keysell (drums, sample pad) – have old heads on young shoulders. And the biggest curveball of all? Their challenging, eccentric music couldn’t sound further away from the Home county they live in. November’s Soap Carve EP was experimentation at its most joyous: vast, stirring and playful, devoid of big stumbling blocks. Though composed on a simple bed of guitar, bass, drums (and the odd sample), the trio somehow made a parcel of intricate sounds, wringing each component out over Alt-J-esque vocal lines. The EP struck that rare and beautiful balance between leftfield music and pop, deservedly praised by critics and radio DJs. We had a chat with the band to see what this new attention has brought, discovering in the meantime their love Canadian music and gangster noire 80′s swing. Oh, and Ascot doesn’t have a music scene. How do you feel about the response to your music so far? We feel chuffed from what responses we get. It definitely makes us feel comfortable with what we are doing. 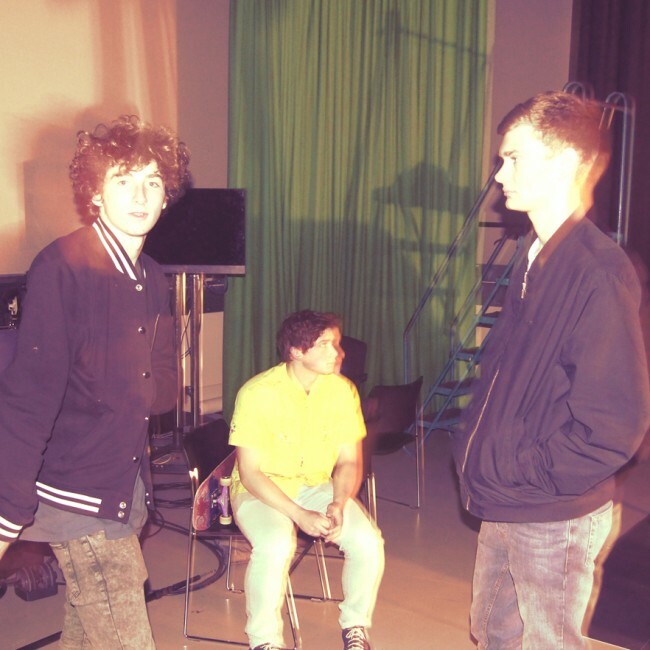 What’s it like to be compared to bands like Alt-J and Animal Collective? Both of the bands are extremely different, especially when compared to each other. It’s a nice comparison that we take from that. It’s kind of like an intelligence meets a madness. We like that “two opposite ends of the spectrum meeting in the middle idea”. It’s a heart-warming sentiment. How would you describe your hard-to-pigeonhole sound? We believe an onset description is that we are experimental, playful and connective to the listener. Tell us about Febeuder’s beginnings? It began without our own awareness. Songs were being made spontaneously. The three of us played our own instruments and it then bloomed into our own roles within the music. It was an instinct to try something new, exciting, something we didn’t really know much about. How did you come up with the name? Does it mean something? The name, Febueder – it is this completely made up thing/creation. We want the songs to form meaning and for the name of the band not to interfere with these meanings. You guys all live in Ascot. What’s the music scene like there? Ascot doesn’t have a music scene. There’s a jazz orientated venue, but that’s it. “Alligator” is the first track we heard from you. What’s it about and when did you write it? Alligator was written about communication with one another and falling into something magical, or of bad fortune. It’s about learning and reading from each others’ lives. It was written in December 2012 (that seems like quite some time ago) and we recorded it around February last year. What are your musical and/or artistic inspirations? Musically we are inspired by a wide range of artists, such as Graham Van Pelt (Miracle Fortress/Think About Life), Zach Condon (Beirut), Sandro Perri, Dan Snaith (Caribou) (to mention a few). At the moment with our next EP, which we are currently recording, our inspiration is that of a slow grooving gangster noire 80′s swing, with a jungle of the city at the heart. What does writing and performing music mean to you? What do you want to get out of it? Writing and performing is internally rewarding. It means that we are more than satisfied with what we are doing. To do this for a living is what forms the motivation. To be able to have the freedom of time to create and perform music is what we’re doing this for. In the near future we are eager to finish recording and release a second EP. An album is also in our minds to follow. We’re working to blossom more. Soap Carve EP is out now on Tape Club Records.